A sunrise simulator alarm clock is really a great gift idea for anyone. Besides from just being really cool it also helps your body to prepare to wake. For people that have trouble getting out of bed in the morning, an alarm clock that simulates sunrise will be a home run. 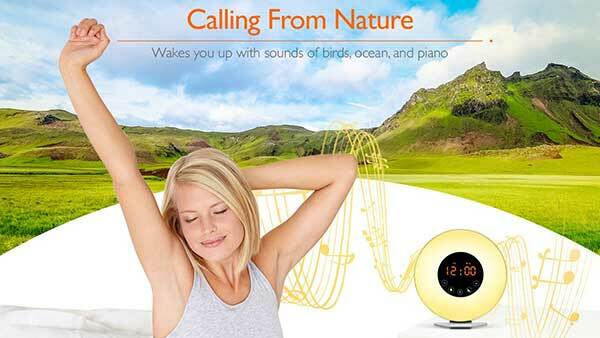 This is a cool alarm clock that simulates sunrise. The light gradually brightens from zero to 100 percent brightness over a 15, 30, or 60 minute period before it goes off, allowing your body to prepare to wake. You can choose between 10 brightness settings. For people that have trouble getting out of bed in the morning, an alarm clock that simulates sunrise will be a home run. The lamp digital alarm clock has 7 lamp colors and many natural alarm sounds. The lamp is lit by small 18 LED bulbs can change between orange, indigo, blue, red, green, white, and purple. The alarm comes with the clock itself, a USB cable to charge the alarm, a 5V/1A Adapter, and manual. This is a home run gift for anyone on your buying list.